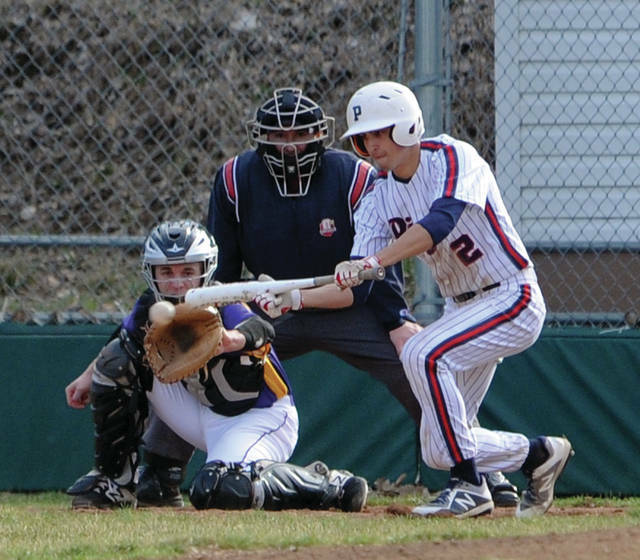 Piqua’s Owen Toopes puts a bunt down against Vandalia-Butler Tuesday at Hardman Field. Piqua third-baseman Ethan Pohlschneider takes a throw on a Butler steal attempt Tuesday at Hardman Field. 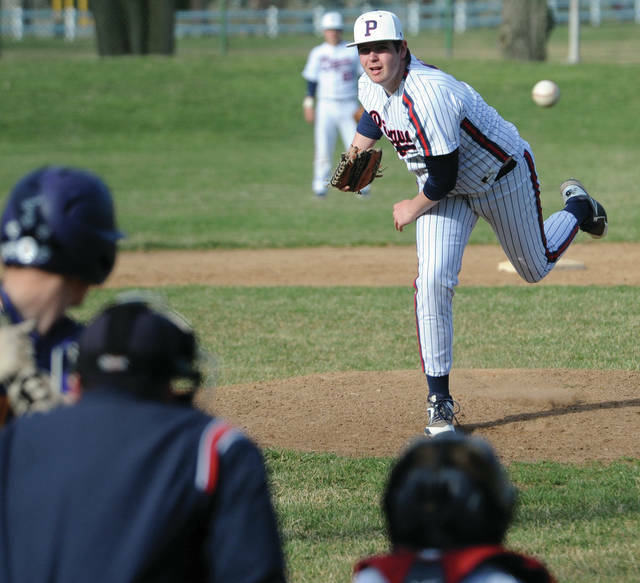 Piqua pitcher Iverson Ventura throws a strike against Butler Tuesday at Hardman Field. Piqua batter Micah Karn drives a gound ball through the infield for a hit against Butler Tuesday. 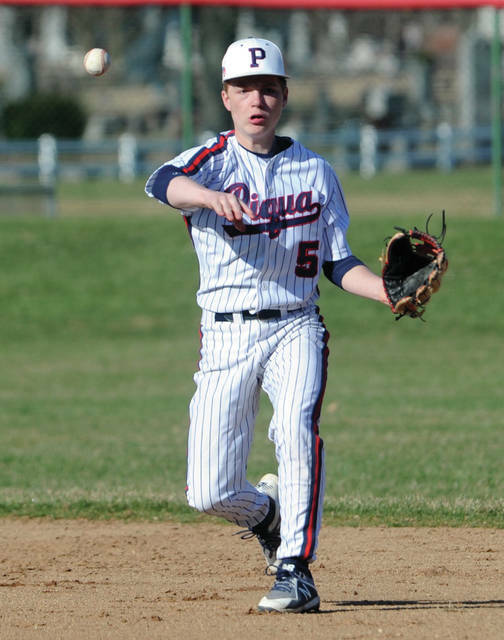 Piqua second baseman Zack Lavey throws out a Butler baserunner Tuesday at Hardman Field. 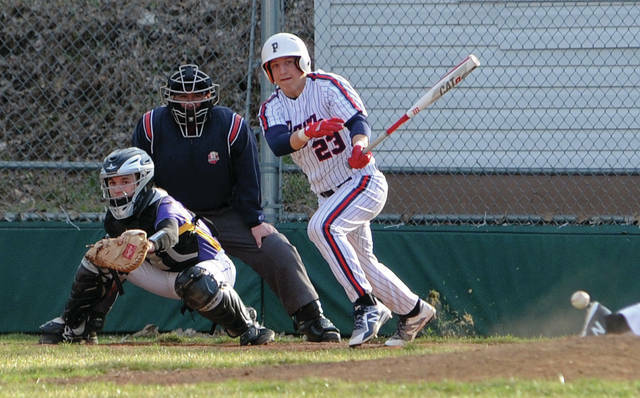 After a roller-coaster game Tuesday at Hardman Field, the Piqua and Butler baseball teams were scheduled to do it again Wednesday at Butler. In a back-and-forth game Tuesday, Butler was able to rally from a 9-8 deficit after five innings and win 12-9. The Aviators improved to 3-2 overall and 2-0 in GWOC American play, while the Indians dropped to 1-2 overall in losing its GWOC American opener. Owen Toopes took over for Iverson Ventura on the mound for Piqua in the sixth. After he retired the first two batters, Butler scored two runs to take a 10-9 lead. Cooper Harestad had a single and scored on Karter Peck’s second double of the game. Peck would come around to score on an error to give the Aviators the lead. Kaden Echeman pitched the sixth and seventh for the Aviators and Piqua threatened to tie it in the home sixth. Iverson Ventura, Matt Wellman and Dylan Motter all walked, but Butler was able to get the potential tying run out at home trying to score on a wild pitch. Butler added two more runs in the seventh without a hit. Mike Masters walked and scored when Cam Miller reached on an error and Miller scored on Zach Fults’ sacrifice fly. 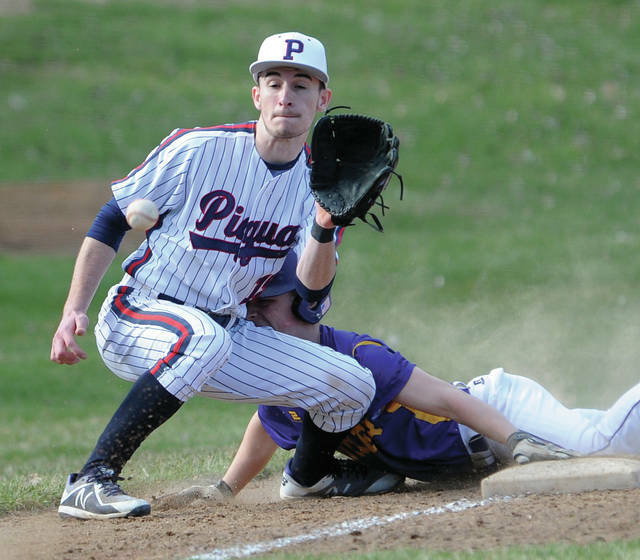 Piqua was unable to score in the home seventh as Butler held on for a wild win. The game had started with Piqua taking a 1-0 lead in the home first on singles by Mick Karn, Toopes and Ethan Pohlschneider, with Pohlschneider getting the RBI. Butler scored two runs in the second to take the lead. Peck doubled and scored on Will Yeary’s single and Yeary scored on starting pitcher Quinton Hall’s fielder’s choice. The Aviators made it 3-1 in the top of the third. Fults singled and came around to score on Harestad’s single. Piqua answered with five runs in the home third to go up 6-3. Zack Lavey and Karn both singled and Ventura helped himself with a two-run double. Blane Ouhl, Jerell Lewis and Motter walked, forcing in a run and an error, with Miller replacing Hall on the mound. Cameron Deal’s ground ball scored two more runs. Butler scored two runs in the fourth to close within 6-5 with Miller helping himself with a sacrifice fly. The Aviators then took an 8-6 lead in the top of the fifth with three runs. Boston Smith started things with a double and scored on Harestad’s sacrifice fly and Yeary singled and scored on Hall’s single. Hall would scored on an error to cap the rally. Piqua came right back in the home fifth with three runs to go up 9-8. On run scored on a wild pitch, while Karn had a RBI single and Pohlschneider’s fielder’s choice gave Piqua the lead. But, Butler would score four runs in its final two at bats to get the win. Ventura and Toopes combined on an 11-hitter, striking out one, walking three and hitting one batter. Hall, Miller and Echeman combined on a nine-hitter for the Aviators, striking out six and walking 10.